Access to affordable, reliable transportation is one of the cornerstones of independent living. Without transportation, people cannot get to and from jobs, medical services, and community resources. 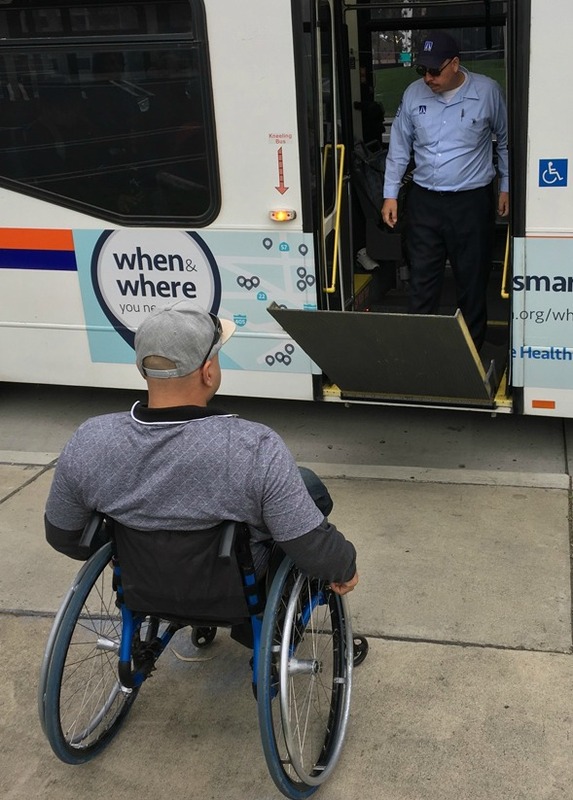 The goal of the Mobility Management Program (MMP) is to expand transportation options for people with disabilities. The MMP team says that seeing former consumers out in the community riding the bus on their own is very gratifying, because it shows that hard work and dedication pays off through greater independence. Orange County residents, who are 18 years of age or older and have a disability, are eligible to be consumers in the Dayle McIntosh Center (DMC) Mobility Management program. For more information about the MMP call 714.621.3300 or complete the online form. Potential consumers are referred to the Mobility Management Program by a variety of sources such as teachers, case managers from other organizations, family members, friends, and the Orange County Transportation Authority (OCTA). Individuals may also be self-referred. When a person is referred for MMP services, the assigned travel trainer conducts an assessment to determine the individual transportation needs of the consumer and to recommend the most appropriate options for specific situations. Trip Planning: Instruction regarding how to use phone apps, online maps, and telephone assistance to determine bus routes for specific destinations. Travel Training: One-to-one instruction including locating bus stops, paying a fare, boarding and exiting the bus, using the pull cord to signal for a stop, and transferring to connecting buses. Applying for Special Programs: Assistance with the process for obtaining para-transit services or reduced fare bus passes. 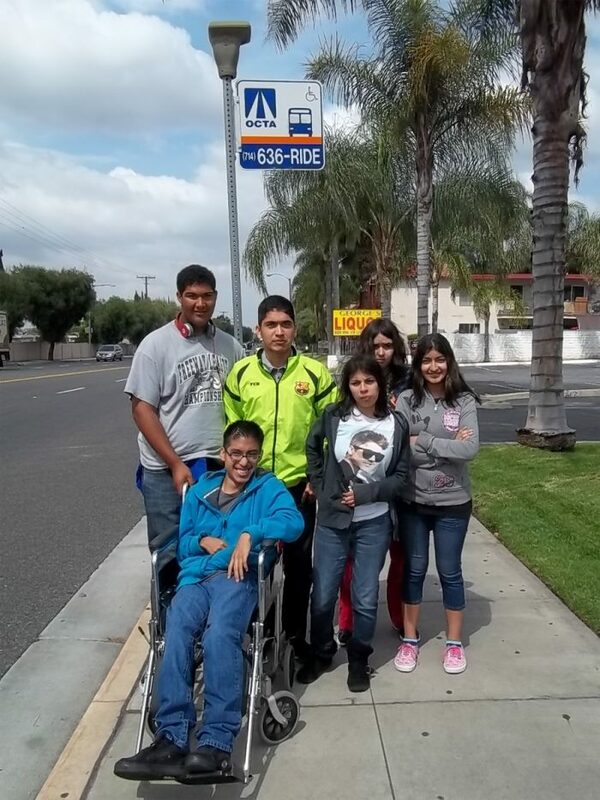 MMP staff also conducts bus safety presentations and group travel training sessions for special education classes. Often students ask for follow up travel training on an individual basis. Typically, a consumer must repeat a trip on the bus at least 3 times before feeling self-confident enough to navigate the route on his own. Travel trainers usually provide one-to-one instruction for 3 different destinations. Instruction continues until the consumer demonstrates the ability to plan and complete trips independently. Occasionally a consumer may withdraw from the program without reaching his or her training goals. Following case closure, a consumer is given the opportunity to complete a survey to express satisfaction or dissatisfaction regarding the effectiveness of the Mobility Management Program. A 49 year old consumer with an intellectual disability was referred to the Mobility Management Program by her counselor at the Department of Rehabilitation. The consumer was interested in receiving mobility training so she could travel independently to potential job sites and one-stop centers. The consumer had lived in Anaheim for many years, but had rarely gone outside the city limits and usually stayed at home. During the first few travel training sessions, the consumer seemed hesitant and afraid of what would happen if she got lost. The travel trainer helped to alleviate this concern by teaching the consumer various travel planning methods so if she were to become lost, she would be able to find her way back home. The consumer learned to take the bus to her counselor’s office. When the consumer received a purchase order from her counselor to buy clothes for interviewing, a trip to the shopping center became a mobility lesson. Eventually, the consumer was able to plan trips and travel anywhere she wanted to go on the bus.